Ironic to see this today; I had this film on last night to keep me company while studying. I'm looking forward to finishing it this evening. ya know, i was surprised the other day to see you weren't the biggest fan of the ending of No Country. TLPS is one of the films i always think of that has a similar tone to the NCFOM ending. i love both films, but love how they leave us even more. i think, to be entertaining, yet still get the point across that a narrative experience is only as good as the person who is experiencing it at that very moment, is a wonderful dynamic i always yearn to see in cinema. that's what i treasure about the endings of No Country and TLPS. 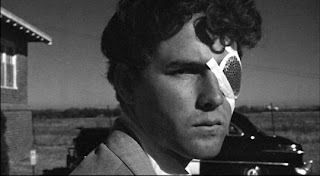 i also see hints of this in the endings of La Dolce Vita and 8 1/2, as well as Raging Bull and maybe even the Sopranos. i've always found it more gratifying to be left with a brand new vision of a basic truth, one subliminally present throughout the film, and will give a pass if it causes a slightly less-than-tidy plot resolution. I guess, the reason the ending of NCFOM bugs is that for 3/4 it's Blood Simple, and then for 1/4 turns into Last Picture Show. TLPS works because it's a consistent. I don't mind tonal shifts (although I'd call the NCFOM ending a genre shift) is that it happened too late in the film. Anyways - whatever, both a great films. Same goes the Fellinis and Raging Bull.